Up for review today is the H.Upmann Reserve Maduro. I purchased a few of these while on a trip in Florida and they have been aging in my humidor for a few months now. I picked it up for a mid-day smoke since it’s Maduro wrapper and sweet aroma appeared to my senses. I usually have low expectations for most of the cigars that “borrowed” the names of original Cuban manufacturers, especially those from Atladis. I’ve simply not had an real standout cigars from them but I keep my options open. The “Reserve Maduro” is not to be confused with H.Upmann’s “Maduro”. There isn’t too much information on the Reserve but from what I can tell, they have more age on them a slightly different blend in the filler. 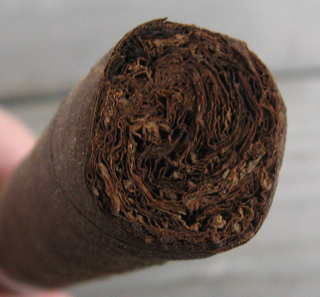 Released in late 2008, the purpose of the cigar was to combat the many new Maduro cigars being released to the market at the time. Great job Daniel! Have you found a mate Tony!? Kidding, I think so man! Nice segue! lol Thanks for the comments. Hope to have a few more posted here soon! Ya, there’s a lot of better maduro’s out there, especially in this price range.